What wonderful prequel for the series Blood Phantom is! Taking place just before and a little into the beginning of Blood Song, Rhiannon has given us a rare glimpse into the enigma that is Rodden Lothskorn — his loneliness, his driven nature, his struggles, his frustrations, who he is and want he wants — as he tirelessly works to find an edge over the ever-increasing Lharmellin threat that’s descending upon his world. It’s fantastic and enlightening character development for Rodden, and it’s the first time the reader is given a look at the world and his relationships from his perspective — more specifically, Rodden’s place within the royal court of Pergamia, his friendship with Prince Amis, and his first impressions of a certain Amentian someone. *I will say, though, that while I think this is a great introduction for newcomers to the series, I’m a little flummoxed over where to recommend this in the series’ reading order. And this stems from the simple fact that it gives more insight into Rodden. Which please understand, I love. I would drop everything to read anything involving this character, especially if it’s from his POV. But, I also loved the mysteriousness surrounding Rodden in Blood Song. I loved that he was a bit of a tough nut to crack. But that is my own preference, and obviously I’m influenced by the order in which I read the books, which is the order in which they were released. 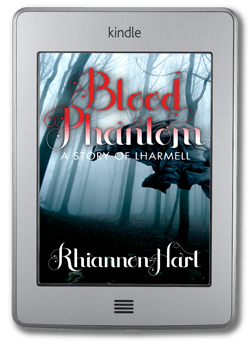 So, if you prefer a bit of mysteriousness, maybe save this short story for after Blood Song. If you just want to dive in head first and see what this world and these characters are all about, then by all means, please jump, because it’s outstanding. – Necessary? No. But great character development! -Where does it fit? Before Blood Song, it’s a prequel. BUT please see my asterisked comment above for my full thoughts on series order. 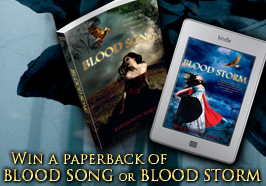 AND, it just so happens that we’re giving away one copy of your choice of first two books in this series, Blood Song or Blood Storm!